Several times now I've fought some legendary creature and in the middle of the fight they suddenly mutate and heal back to full. What other effects does this mutation do? Does this mean I can't 1 shot a legendary creature with a sneak attack? This is all from my own observation and I don't have an official source for it. But since I play on survival and found a LOT of legendary enemies yet, they are kinda reliable. It may get a random "perk" from a set list. Green aura: The mob deals much more radiation damage per second . Seen on a legendary glowing one at lvl 16 and a legendary ghoul at lvl 15. Orange aura: The mob dealt additional DoT damage with each hit. Seen on various enemies past lvl 20. It seems to be seperated between nuclear DoT and "normal" DoT (maybe even poison DoT? 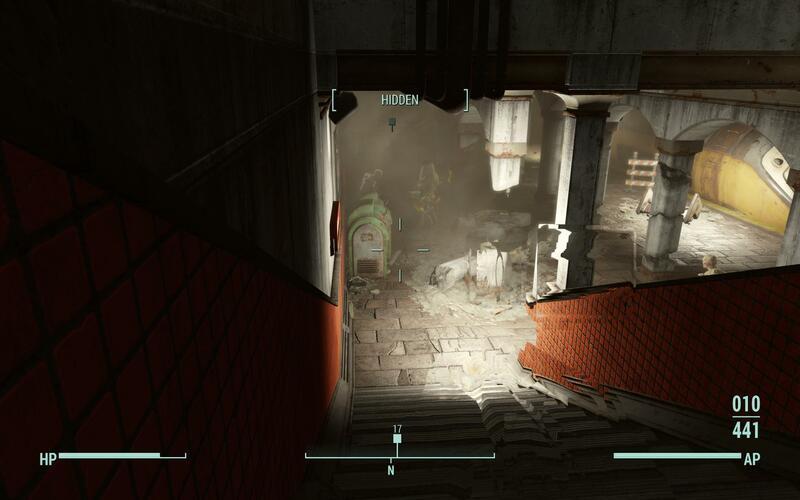 ), since, when I wear a power armor, some enemies which dealt huge DoT to me before barely dealt any DoT to me. Red aura: The mob gets a huge damage boost to the boost he already gets. A muted watchbot almost killed me within 2 seconds when he didn't even deal half the damage before. Seen on this Watchbot ~ lvl 24. Yellow aura: The mob has highly increased movementspeed. Seen on a Mr. Gutsy. Nothing: The mob doesn't get an aura. Therefore, I assume it doesn't get any special perks. Not sure though, maybe it does, but a weaker version. Maybe also: The stronger the aura, the stronger the perk. (Unsure!) Blue aura (??? ): Grants huge damage resistance to the resistance the mob already gets. Was curios, and it could survive 2 Fat Men. Seen only once on a radroach at lvl 26, seems to be extremely rare or I'm colorblind, I was quite tired when i encountered this. This is all the information I could find out by now, maybe there is more, I'll update the answer once I know it. To answer your last question: It is very possible to one-shot a legendary enemy. I do it all the time, and highly recommend it. The only way they mutate is if they're still alive after having been dropped to ~50% or less health. As long as you've got a gun that can take out more than half their HP, you can avoid having to deal with the mutation. Personally, I prefer the one-shot kill approach whenever possible. I find the Gauss Rifle to be very effective for this (currently at level 70, on default difficulty). If your best gun can't do the whole job in one shot, but it can still knock off more than half the enemy's HP, save it for last. Work the enemy down a bit (but not to 50%) with something weaker, then finish 'em off with the big gun once their HP is within its damage-dealing capabilities. Can't comment on other answers, but the legendary protections always die in a nuclear explosion as long as they are activated. So that could just be very frightening to have a super fast robonuke coming right for you. How do legendary weapon effects work with shotguns? What exactly are critical hits?